If you've been in an accident, it's your right to choose where to have your vehicle repaired. We'd like you to choose Wolf Collision Ltd. Formerly known as Roland Comeau Auto Body, we have served the needs of drivers in the Halifax Regional Municipality (HRM) area since 1954. Specializing in all aspects of collision repair for all makes and models of domestic and imported automobiles and light trucks, we continually strive to provide the highest quality repairs possible and back this commitment with a limited lifetime guarantee. Trusted for over 60 years, Wolf Collision Ltd. is the auto body repair shop in Halifax that is preferred by most insurance and leasing companies. One reason is because our Red Seal auto body and refinishing technicians receive the latest training necessary to ensure your vehicle receives the best repairs possible. Wolf Collision has been awarded the I-Car® Solid Gold Class Professional Status for 14 consecutive years and we have an A+ rating with Better Business Bureau. We do our part to care for the environment by recycling whenever we can. 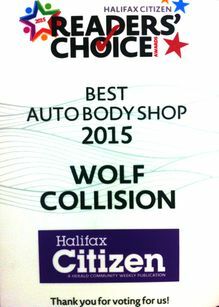 With a staff of 15 highly qualified people providing excellent service, Wolf Collision Ltd. is located just off Robie Street at 6046 St. Albans Street in Halifax. We offer free estimates Monday through Friday from 8:00 AM – 4:30 PM; vehicle must be present. Contact us today to request a free estimate on first-class body work, painting and frame repairs.